Latex rubbers are fabricated from latex suspensions. During the fabrication process, latex particles are bound together while water is removed from the suspension. This report shows that the mechanical properties of latex rubbers can be improved by incorporating a small amount of amphiphilic submicron particles as interface modifier. The incorporated particles were prepared from bovine serum albumin (BSA) and ethyl cyanoacrylate (ECA). These particles changed conformation while mixing with latex suspension, and bound to latex particles to induce aggregation of latex. 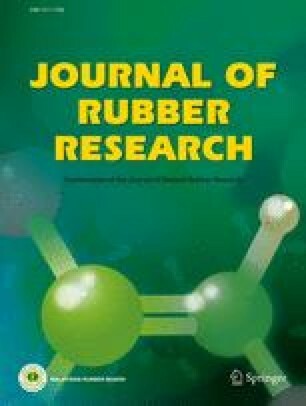 The improved mechanical properties of the produced reinforced latex rubbers were characterised by mechanical analysis (stress-strain). Incorporation of microparticles into latex improved mechanical properties such as % elongation and energy at break up to ~250%. On the other hand, tensile strength and tensile modulus were not significantly affected by the incorporation of particles. Experimental results showed that the optimum BSA:ECA weight ratio for particles is 1:3, and the optimum percentage of particles is 3%. The mechanism for the reinforcement of latex rubber by microparticles has been elucidated by zeta potential analysis and optical microscopy.